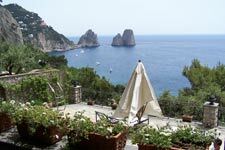 Villa HII GVA – This 3 bedroom apartment was located 5 minute walk from the main Piazza in Capri. This was a fantastic 3 bedroom apartment. Best for 4 adults and 1 or 2 older children. It had a large master bedroom, lovely furnishings, small gourmet kitchen and nice outside sitting and covered dining area (with partial view). For larger groups, you can combine with Nicole, Martina, and Studio at Ginevra, all sharing a grass courtyard area with covered sitting area and small children's plunge pool. Villa HII PIC – This 4 bedroom, which I prefer as a 2 bedroom has the best view of the Faraglioni. The outside space here is just fantastic. You can actually walk to the main Piazza from here, which would take you about 15 minutes or so, uphill. In between villa visits on Saturday, Allegra and I stopped in the Piazza for a quick lunch and coffee, and some people watching, for there is no better location than this. It was then that I saw a familiar face walking towards me. It turned out to be Rick Steves, who has a travel show on PBS every Sunday morning, as well as a line of travel books, which he updates yearly – very informative. It was great to meet my favorite travel guru. On Sunday, after breakfast we had a stroll down the lovely pedestrian walkway through Ana-Capri, which is really the most perfect little village I had ever seen. It is clean, pretty, with nice shops and restaurants, and not too touristy at all. This is where the locals live. There were families out walking together and little children playing soccer in the square in front of the church. Loved it. After picking up sandals from Antonio Viva's famous sandal shop in Ana-Capri, we made our way down to the port to meet up with Gennaro, a friend of our hotel owner’s son, Paolo. 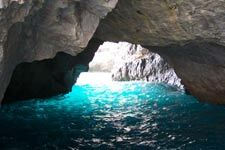 He took us on a tour on his small wooden boat around the entire island, stopping at the Blue, Green, White, Champagne and Fishermans’ Grotto, before taking us through the Faraglioni. I did this same tour about 9 years ago and it was equally thrilling today. I recommend this for everyone who visits this gem of an island. It was the highlight of my trip. After getting back to Marina Grande and checking out all the boats there for the Rolex Regatta, we headed back to our little paradise of Ani-Capri and had dinner at "Rondinella", which I enjoyed and was very convenient , just across street from where were staying. What a great last day on Capri!